They were known as the Perfectos and they existed for just one season in St. Louis. They didn’t leave the city, they just changed their name. 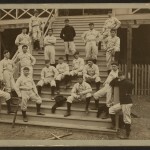 In this 1899 season the Perfectos were essentially the same team that had been in St. Louis for the past 17th season and now was head for their 8th season in the National League. In the 1899 season the team won 84 games and lost 67 which put them in 5th place in the National League. Let’s move backwards a bit in history and look at some of the things that changed in the organization from 1898 to 1899. Anytime someone gets involved in a new business they tend to make changes to suit themselves and the Robison’s were no different. They didn’t like the dull brown colors in the uniform so they had the brown color replaced with a shade of red. They changed the ballpark name from New Sportsman’s Park to League Park. They changed the name of the team from the Browns to the Perfectos to get away from the identification of the previous ownership. Patsy Tebeau was hired as manager. Then the owners did something that got themselves in some trouble. They also owned the Cleveland Spiders and instead of fighting over fans they brought all of the best players the two teams had to St. Louis on one team. This arrangement was outlawed and two teams were eliminated from the league. The season begins with Cy Young on the mound and with a 10-1 win on April 15, 1899. Young and a host of others all played in Cleveland the previous season. The Perfectos fins 84-67 and the other team owned by the Robison brothers, the Cleveland Spiders, lost 134 games and won 20. The Spiders disbanded after the season.